The National Seismic Hazards Mapping project provides an online web tool for determining the probability of a large earthquake within 50 kilometers (~31 miles) of a specific location over a certain time period. The calculation is based on the latest available information from seismic hazard data. However, asking if it's safe to travel somewhere because of recent earthquakes is almost the same question as "Can you predict earthquakes?" A particular area can be "having a lot of earthquakes" for many different reasons, and we usually cannot tell why. Sometimes there are many earthquakes because they are part of an aftershock sequence following a large earthquake. Depending on the magnitude and type of earthquake, these aftershocks can continue for days, weeks, or months. 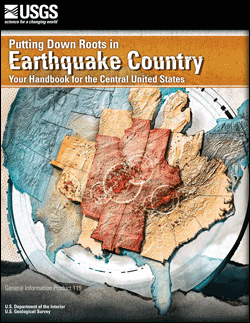 Some areas are prone to swarms of earthquakes, particularly geothermal areas. Other times an area has several small earthquakes and nothing more happens. Rarely, several earthquakes precede a larger earthquake, but they don't look any different than any other earthquake, so we don't know they're foreshocks until they actually become foreshocks. So, to answer the question “Is it safe...”, we don't know. You will have to make the decision based on whether or not you feel comfortable with your plans. USGS Map: 2015 and 2016 Seismic Events in the Central and Eastern U.S.
USGS map displaying seismic events in 2015 and 2016 in the central and eastern U.S. There is a high hazard for earthquakes in five areas, which are Oklahoma-Kansas, the Raton Basin, north Texas, north Arkansas, and the New Madrid Seismic Zone. USGS table showing state population levels exposed to potential earthquake ground shaking. Click Image for High Resolution.